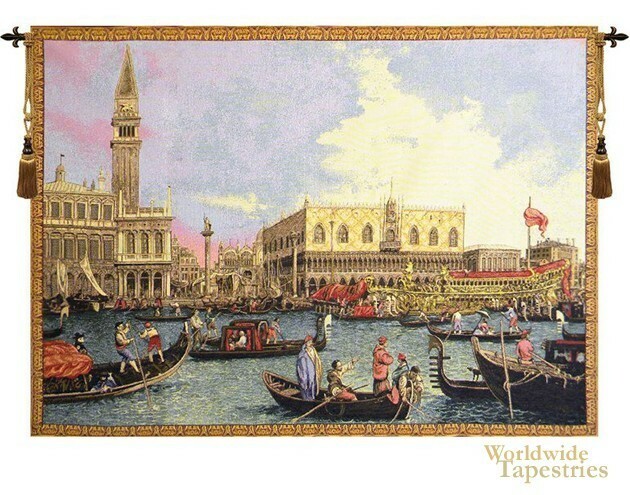 This cityscape tapestry "Bucintoro Venice" is full of intricate detail. It shows the vibrant and flourishing city of Venice, the city of canals, where thoroughfare via the waterways is the way of life. Venice is an ancient city filled with history, and here we see an active day with gondolas and vessels on the canals exchanging trade and transporting people. The Fondazione Bucintoro in 2008 rebuilt the bucentaur, an important ship in Venice's history. The bucentaur refers to the major vessel used every year on Ascension day from around 1311 til 1798 to take the dog to the Adriatic Sea to perform the Marriage of the Adriatic which was the symbolic wedding of Venice to the sea. This cityscape and nautical art tapestry "Bucintoro Venice" is backed with a lining and has a tunnel for ease of hanging. Note: tapestry rod and tassels, where pictured, are purchased separately.